ST121UTP is a VGA over Cat 5 video extender that allows you to connect up to four (two local and two remote) monitors to a single PC. 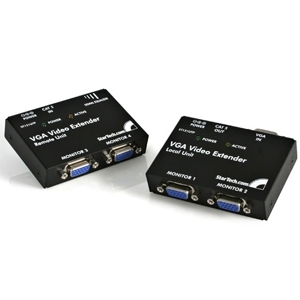 The VGA video signal is sent to up to four remote monitors over standard 4 pair Category 5e UTP cable (terminated with RJ45 connectors), and supports distances of up to 150m / 500ft between the VGA source and the intended display. The ST121UTP VGA over Cat 5 UTP Extender is an out-of-the box solution comprised of a local VGA transmitter and a remote VGA receiver, creating the perfect point to point digital signage solution. We needed a way to get a VGA signal from our sound room to 2 ceiling mounted projectors 140 ft. away at the front of the auditorium. Running the signal from the first sender box to the receiver box via cat5e was simple and provided two VGA outlets right at the projector. Amazing! The laptop vga out signal was more than enough for a great image.